You’d be hard-pressed to discern that Emma Faye Rudkin once struggled with confidence. It’s not just that her deafness, a result of an infection when she was 3, hasn’t held her back. In fact, it’s so ingrained in her identity that positive energy toward those around her beams right through it. It inspired her to found the nonprofit Aid the Silent, which helps economically disadvantaged deaf children and teens fulfill their potential. And for her work in that endeavor and others, Rudkin has been named The Business Journal’s 40 Under 40 Woman of the Year. Yet there was as a time when Rudkin couldn’t have foreseen the success she’s having now as a young adult. Although she has always been loved by family and friends, she endured loneliness, misunderstanding and depression for much of her childhood, she said. Her parents relentlessly sought resources — equipment, speech therapy, accommodating schools — to help her adjust. But through it all, she felt ostracized and marginalized. As her difficulties continued in middle school — not hearing a classroom lesson or missing out on an invitation to a sleepover — Rudkin felt something had to change if she was to get more out of life. That change came when she signed up for a summer camp where she was fully embraced. Her deafness was not seen as an insurmountable disability, and it would no longer define her. Rudkin in her early teens began exploring musical theory, learning to sing and play instruments such as the guitar and piano. Vibrations were her ally. As she became more confident in her abilities and approach to life, and after talking with a mentor in another summer camp, she sought to compete on the pageant circuit and build a platform to advocate for the deaf and hearing impaired. In 2015, Rudkin became the first deaf woman crowned Miss San Antonio and won the same pageant two years later. She also placed in the top 10 of the Miss Texas Pageant and has been part of Fiesta royalty, appearing at hundreds of events. 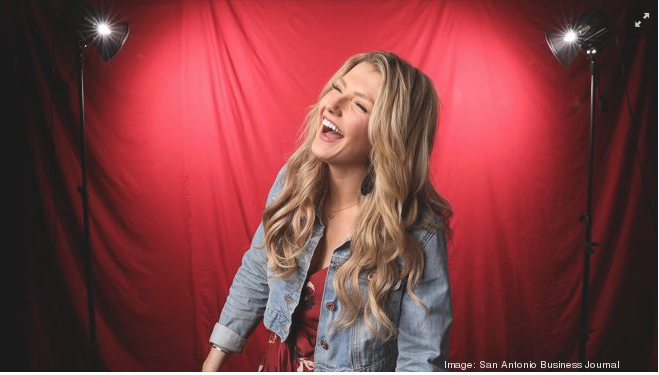 Shortly before her first Miss San Antonio Pageant, Rudkin founded Boerne-based Aid the Silent, which helps people acquire hearing and speech equipment, sign language lessons, ministry-related activities and education-enrichment programs. It raises money through events such as a 5K run-walk, to be held May 19, which offers free entry to deaf and hearing-impaired participants; and the Good Vibrations Music and Art Festival, which is open to all ages and backgrounds, and is especially accessible to the deaf community. “When we have these events, it’s finally giving something for them, that’s about them,” Rudkin said. Rudkin is the nonprofit’s main fundraiser, speaking frequently to all kinds of audiences. She does advocacy work elsewhere to increase access for the hearing-impaired. “We break down barriers and walls a lot,” she said. She’s launching a social media campaign, #ShowYourAids, urging deaf people to post photos and videos showing pride in who they are. Rudkin and local musician Ryan Proudfoot, who is not deaf, provided musical support for a documentary, “Love Hears,” about deaf-hearing couples. Their video project, “Love Hears: In the Silence,” has had thousands of online views and shares. Rudkin, now 21, sees the deaf and hearing-impaired community making strides compared with past years of struggle. Edmond Ortiz is a freelance writer in San Antonio.